Brooklyn’s Microscope Gallery, run by Elle Burchill and Andrea Monti, will be inaugurating its third year with a solo gallery show by film artist Joel Schlemowitz called “Light Objects.” The show’s opening will be on Sept. 15 and will feature a special live film-related performance by Schlemowitz. While the performance will be a special once in a lifetime event, the gallery show of “Light Objects” will feature displays of Schlemowitz’s unique camera paintings and cinema sculptures. In a series of more than a dozen camera paintings, Schlemowitz illuminates original 16mm film in light boxes — with the many frames joining to form a single, static mosaic-like image — to re-contextualize the notion of the movie and the relationship between film and photography. Modified projector works, shadow plays and other related sculptures considering the elements and tools of light and time will also be on view. To create an image for his camera paintings, Schlemowitz uses his 16mm Bolex camera “as a brush,” meticulously panning back and forth to record a scene. 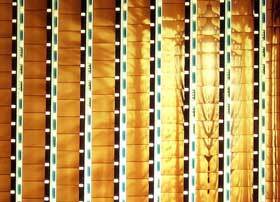 The film is then developed, cut into strips and arranged side-by-side across the light box. The result is a striking light picture portrait composed of the many smaller sequential images of the subject, captured during the shooting and visible in its still, film frames. In effect, the film becomes a photograph and the photograph a film. The subject matter of the camera paintings — friends & collaborators, burning light sources, recent voyages to Japan — are often personal, reflecting the artist’s current interests and obsessions. Schlemowitz also manifests his search to expand the possibilities of film through live film performance; magic lantern shows with glass slides and Victrola; and arcane media collaborations.